Prior to Edo Period, Japanese dishes were made with clay and wood. However, in Edo Period, the glass products were introduced from overseas and quickly spread in the country. At first, these products were simply imported. However, the foreign glass makers were invited to Japan to teach various skills and gradually, Japan started producing original glass handcrafts. Edo Kiriko is one example of those Japanese glass handcrafts. The patterns of those products that require special skills give the impression of Baccarat. Nowadays, Edo Kiriko has a good reputation as one of traditional Japanese craft works and is a popular souvenir. Edo Kiriko originates in Edo Period, but back in those days, the common people were normally using lacquer and pottery. Therefore, although glass products were introduced to Japanese people, there were no knowledge required to produce them themselves. It took a long time before glass products could be made in Japan. Many years later, some European and Irish craftsmen were now allowed to visit Japan. Absorbing skills and knowledge from these foreign craftsmen, new styles of glass handcrafts were established in Japan. A large amount of new glass products were made in order to bring glass products into people’s daily lives. In this way, Edo Kiriko became even more unique handcraft in Japan and has gained reputations from many Japanese as well as people overseas. kept the chicness and retains some attractiveness that the glass products in other countries do not have anymore. Especially, Edo Kiriko has a great variation of patterns. Even for two glasses with very similar shapes, they could have very different impression if they differ in their patterns. When first the production of glass handcrafts took place in Japan, for a while, there was also another style of Japanese glass handcrafts called Satsuma Kiriko. However, the traditional know- how was almost entirely lost due to fires in the studios. On the other hand, Edo Kiriko was successfully passed on to next generations. One of the reasons for its success was that unlike Satsuma Kiriko which was manufactured as crafts and thus were only available for certain groups of people, Edo Kiriko was produced to be used by the common people. This made Edo Kiriko more widely known and resulted in getting more new people to become apprentices. The patterns of the Edo Kiriko are unique and quite different from Baccarat Glass. It also has a great variety of patterns. To name a few, “Nanako” symbolises eggs of fish forming chains, “Shippo” uses traditional “Shippo-tsunagi” pattern and “Rokkaku-kagome” looks like the patterns of the woven baskets made out of bamboos. There are traditional patterns as well as new designs. Glass makers are continuing their handcrafting respecting traditions as well as always trying to create new designs. Also, there is a great variety for the types of glass products as well. In addition to traditionally used dishes and bases, there are beer and wine glasses, interior goods and accessory. The changing of the colours are the crucial part of Edo Kiriko. In the production process, first, thin, pale coloured glass is made and then, transparent glass is blew into this glass. 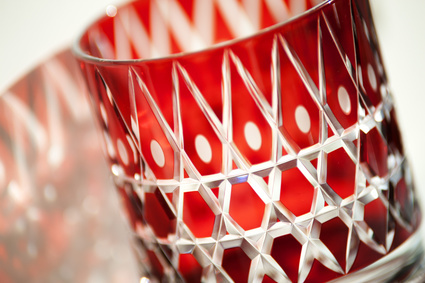 After this two layered glass is made into a shape, it is curved to create its unique patterns. Because of the subtlety of the colour that depends on the types and amount of the glass and also how it is curved, it projects the personality of the maker and so produces a great variation of products. Moreover, since the property of the glass is different now compared to what was used in Edo Period, new products and old products have different characters. This can sometimes make the old products quite expensive on the markets. Although Edo Kiriko is a traditional Japanese handcraft, it has its origin overseas. The way Edo Kiriko was born, keeping the traditions while actively taking in new elements and bringing it into its perfection by the special skills the Japanese had, is very typical of Japan – the country that adopts foreign cultures and then transforms them into their own. Edo Kiriko products are perfect not only for yourself but also as gifts, so if you are interested, please check it out and see what kinds of products they offer.